Charting Companion 6 now available - 2 new dazzling charts! It is a rare event when a new type of genealogy chart is introduced. Progeny Genealogy, the makers of the popular Charting Companion software, is pleased to announce two new, unique, innovative ways of showing your family history: the Fractal Tree and the Dandelion Chart. Click here to purchase for 34.95. Add a third generation, including the grand-parents. The new boxes now sprout vertically. On the paternal side, Raoul's parents (Calixte & Honorine) are displayed. On the maternal side, Jeanne's parents (Thomas & Amanda) are displayed. By tiling the pages, you can assemble a chart of unlimited size from standard paper or A4. You can create a PDF of a single large page (36" x 72") and take it to a print shop for printing on a large printer. You can embroider two types of charts: Ancestor Fan, and Descendant Fan Charts. Format them in quarter-, half- or full-circle - your choice! The program can render up to 5 generations from your Legacy family file on any one Embroidery Chart and still preserve the legibility of lettering. 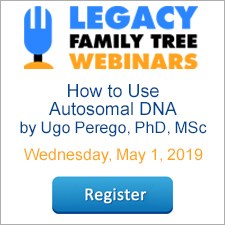 This is one more way that Legacy Charting Companion’s powerful family tree charting capabilities can bring your family history to life. You won’t find this feature in any other genealogy program. Legacy Charting Companion’s new Embroidery Chart feature generates a file format called "DST." This Dynamic Stitching file enables any commercial embroidery shop to satin stitch the chart you created on a T-shirt, vest - whatever you choose. But you don’t need to worry about all that. Charting Companion makes it easy to create the file: you just send it off for processing. Check the Embroidery Shop Locator below to find a supplier near you. If you happen to have a computer-compatible home sewing machine, lucky you. DST works with most machines, so you can do it yourself - or for others. Family tree charts supported: Ancestor Fan and Descendant Fan Charts. Visit http://www.legacyfamilytreestore.com/ProductDetails.asp?ProductCode=LCC for more information or to purchase for just $29.95. If you purchased within the last six months, you get a free upgrade to version 3.0. Contact Progeny Genealogy by phone or email here. If you purchased within the last twelve months, you get a 40% discount. Contact Progeny Genealogy by phone or email here. To learn more about Legacy Charting Companion's other charts and features, click here. Legacy Charting Companion, a Legacy Family Tree add-on program developed by Progeny Genealogy, has a free update available to download. This update adds the industry's first and only Descendant Fan Chart plus a couple of other minor additions. I love Fan Charts. They make it simple to visualize several generations of ancestors. A Descendant Fan Chart is similar, but instead of going back in time to display ancestors in the fan, it displays the descendants of the center person. Take a look at Asa Brown's Descendant Fan Chart below. The new Descendant Fan Chart is included in Legacy Charting Companion 2.1.1 and later, and is available free for existing customers of this add-on software. (Legacy Charting Companion is different than the Legacy Charting which is inlcuded in Legacy.) To update, just click on the link in the email you received when you purchased the product. If you have questions, contact Progeny Genealogy's support at customersupport@progenygenealogy.com. For more information on Legacy Charting Companion, or to purchase for just $19.95, click here. 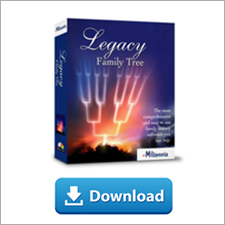 Legacy users can now create colorful family tree charts with Legacy Charting Companion 2.0 from Progeny Software. Choose from over 16-million colors and three color styles to display family lines by gender, generation or lineage. No data entry nor GEDCOM import are required. Legacy Charting Companion reads files directly from Legacy Family Tree versions 3, 4, 5 and 6. And it's so easy to use - just select a person in your Legacy Family Tree file, choose a chart type and presto - the chart is created! edit book reports using all popular word processing software programs, including the new Open Office Writer. Choose from a wide variety of charts and reports, including: Ancestor, Descendant, Fan, Hourglass, Pedigree, Bow Tie, Outline Descendant, Kinship, Family Group Record, Standard Family Group Record, Ahnentafel (Ancestor Book Report) and Register (Descendant Book Report). There are many ways to customize your Legacy Charting Companion charts. For example, you can choose the number of generations, events you want to include, the content of your box charts, the date format, add photos and the list goes on. Also, with the "COUSIN SMART" option you can even avoid duplicate individuals on charts, saving space and clutter. The print preview makes printing your charts easy. Print your chart any size you like, including a large wall chart that can be made by tiling pages together or printing to a plotter. You can even publish your charts using PDF so you can email them to family and friends. Browse through generations of your family tree using onscreen tree views. An extensive search capability will help you find elusive information you may have stored in your genealogy file. Legacy Charting Companion version 2.0 is an exciting new product that helps you see your family tree in a whole new way. We truly believe you'll love the new colorful charts!